The action kicks off in a chicken shop in Madrid where Consuelo, a 62-year-old widow, finds herself confronted with a mysterious face that suddenly appeared on the floor of her shop. Is it a religious apparition? A plot by the poultry mafia? Or even a ghost? And could a peculiar change in her cat’s fur have anything to do with all of this? Her unusual encounter lets her embark on an unexpected journey full of shocking surprises, startling twists and astonishing discoveries. With her dark humour and keen wit she tries to reveal the truth that lies beneath the face, which in turn leads her to one of the most extraordinary unsolved mysteries in contemporary Spanish history. But was she really meant to uncover the secret? Is her quest guiding her into a dangerously new direction that could change her life forever? 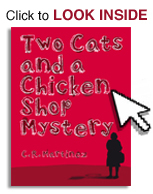 Two Cats and a Chicken Shop Mystery is a funny mystery novel, whose simultaneously amusing and compelling story leave the reader flabbergasted from its opening pages to its stunning finale. It is a fast-paced and intelligent reading experience that takes a sly satirical look at some of the most abnormal phenomena through the eyes of a very normal character. At the same time the story combines a variety of real-life events, both past and present, in Spanish history which places its subtle plot in a more than relevant current setting. The page-turner with real world investigation puts the genre of arcane thrillers into a humoristic, yet convincing new scenery. A parody of the Da Vinci Code? Socio-critical reflections on a crisis? Miss Marple in Madrid? The X-Files meet Woody Allen? You decide! Idea and design of the wonderful book cover by Cristina Corrado.